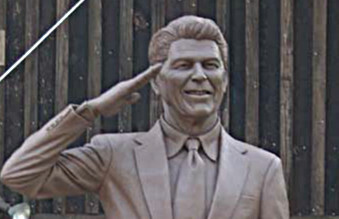 It’s one step forward, one step back for gigantic representations of Ronald Reagan. 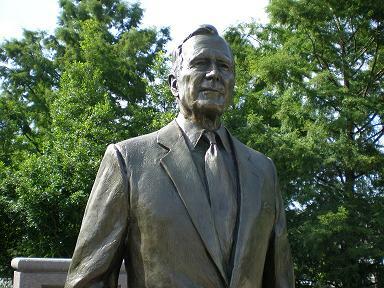 An immense Reagan statue has been dedicated in Covington Louisiana, with a head oddly swollen compared to the original noggin. Elsewhere, setbacks for the cause. A young Bill Clinton led anti-war demonstrations at the London Grosvenor Square American embassy. A Reagan statue was proposed for the square, but has just been turned down by the Westminster Public Art Advisory Committee. 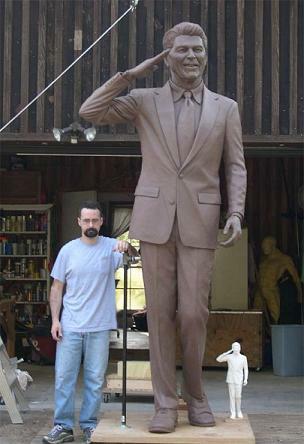 It was double dipping by Chaz Fagen, who’s already making the Reagan statue to go in the US Capitol. 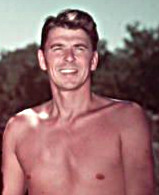 He’s already done Bush Sr., and a Reagan relief bust for the USS Ronald Reagan. More detail emerges on new rides at the Ronald Reagan Presidential Library, Museum & Fun Park, as a team of Kansans travel to California to install a Boeing 707 flight simulator in a shed near the Air Force One Pavilion. 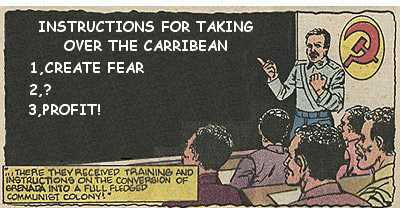 Kansas’s El Dorado Times reports that the vintage hardware’s sad fate is to reward impressionable youths who have survived role playing exercises pretending to re-invade Grenada. New York Sun prison correspondent Conrad Black writes from sunny Florida that the Nixonland hype must stop, claiming author Rick Perlstein somehow missed the hidden wells of Nixon popularity both past and present. 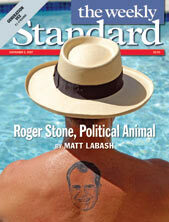 “Is” appears more problematic, despite the frenzied efforts of smooth backed Roger Stone. 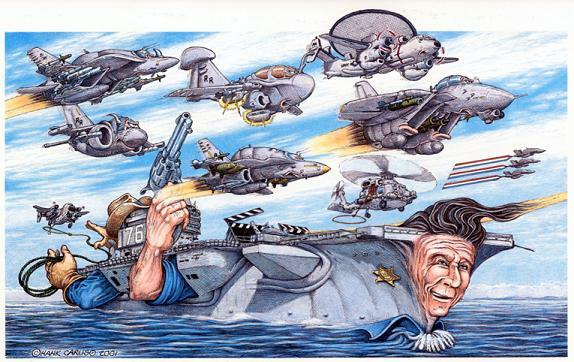 Could there be some other motive for sending the USS Reagan to the Philippines?